Does your device look like this..? The iPod Nano 1G was the first iPod Nano brought to you by the Apple company. We commonly provide LCD screen replacement for the iPod Nano 1G. This is a device that needs screen replacement because the screen is actually quite large. However, it's actually smaller than the iPod classic devices. The Nano's attempted to reconstruct the design of the MP3 player, so they created a much smaller screen real estate and the device was actually much skinnier as well. While making the device skinnier, some of the compact and durability features of the previous iPod classics began to go away and these devices starting to get damaged much easier. 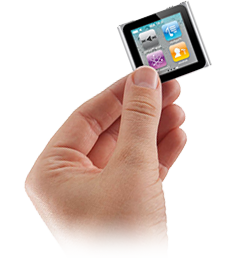 This means that front casing, rear casing, and complete rehousing services are widely needed for the iPod Nano 1G. If you are unsure about the exact problem with your unit, please select our Free Diagnostic Inspection service. For more information about our repair service please read our "frequently asked questions" page.